When Rebecca was pregnant in the fall of 2012, I was first obsessed with the idea of finishing a bunch of UFO’s. One of them was a jacket project. I had an old jeans jacket that was pretty worn, so I took it apart. 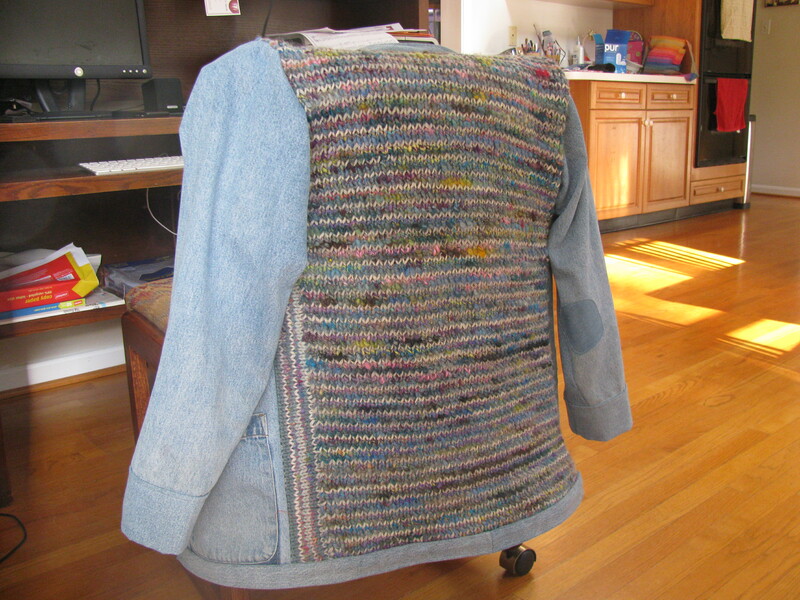 I knit the back of it with 2 handspun hanks that I bought at MD Sheep and Wool (2012 and 2013), plus some yarn I dyed with black beans. I used the old material from the back of the jacket to re-make the collar, cuffs, and pockets that had become frayed. I hate to sew, but sometimes it’s worth it to get out the machine and let ‘er rip! Do you also see the little matching pocket I made for the front? This was a fun project because it was the first one I did completely spontaneously and without any planning. I cast on a bunch of stitches as I watched the results of the Sheep to Shawl contest, and only vaguely imagined how it might end. 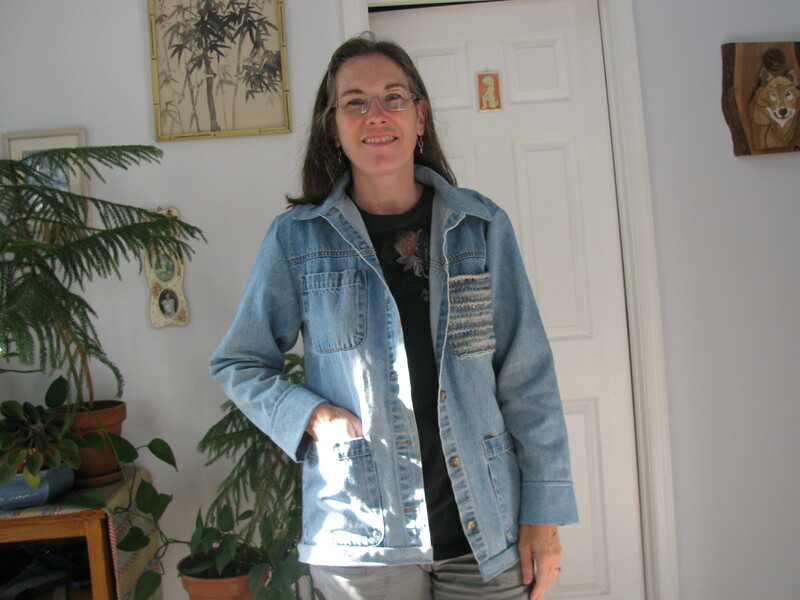 My jacket was 15 years old so I didn’t care if I ruined it…..I just wanted to try an idea. 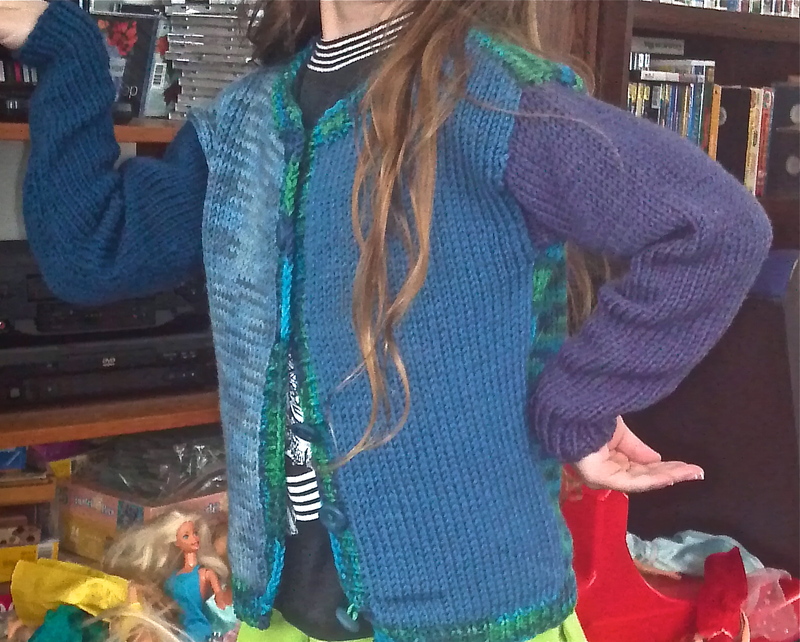 Next I finished a couple sweaters for the daughters of a friend of mine. Both sweaters were the simplest of all sweaters: square backs, drop shoulders, simple sleeves and cuffs. I pretty much designed them in my head too, and guessed at the measurements because kids are easy, right? This was a free yarn from a friend who was de-stashing and it was rather strange to work with…..thick and thin….prone to splitting…..but it was soft to the touch. The next project was a kids sweater I’ve wanted to make for a long time. It’s by Margaret Fisher in the Fall 2004 Cast On magazine. I modified it, but the idea of 6 colors together like this was hers. After those sweaters, I finally started knitting the cotton purple blanket you saw in an earlier post of Rebecca’s. And happy I was that her pregnancy was going so well. 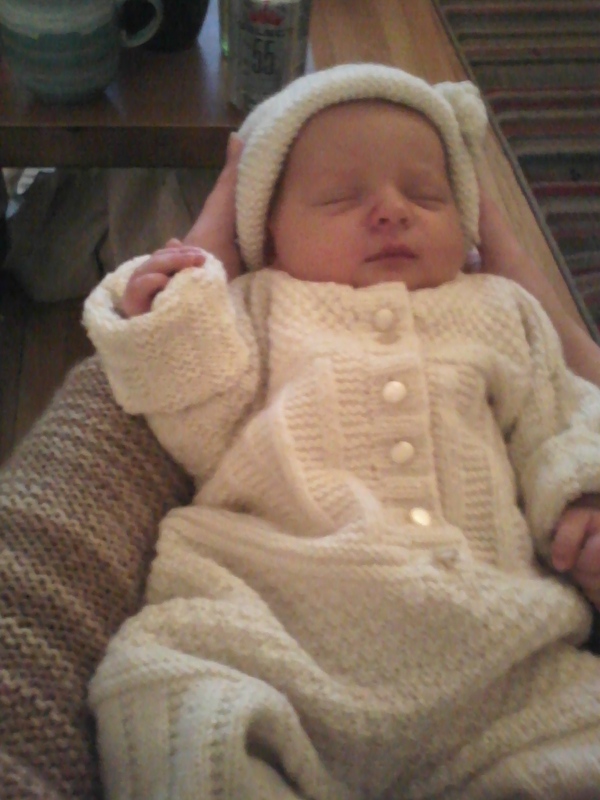 Becoming a grandmother didn’t really hit me until I started knitting Naomi’s romper. It was January. The purple blanket was done. Christmas was over. The baby shower was over. I had 5-6 weeks to crank out the romper if it would be done by the due date. 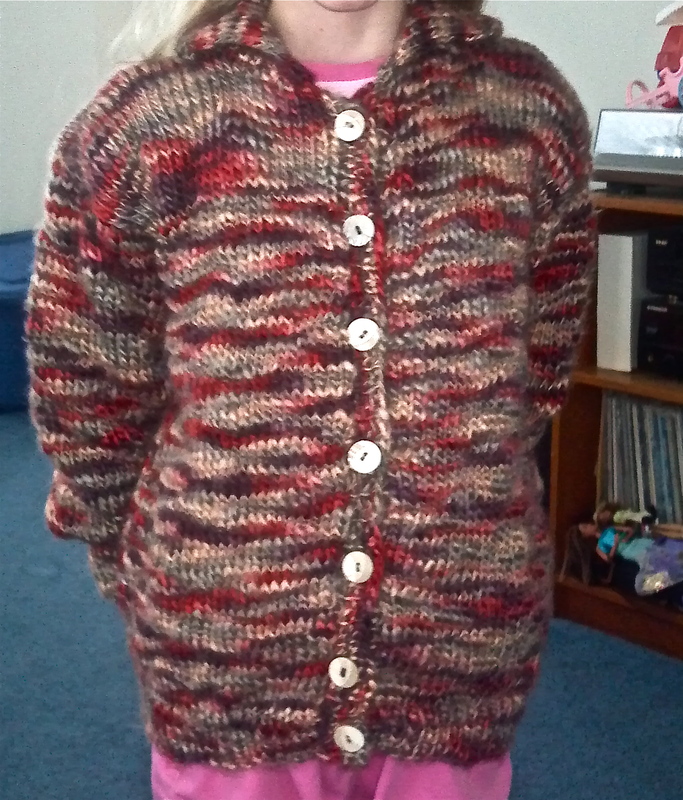 The pattern I chose was a Dale Garn pattern by Kari Haugen. It was a wonderful pattern in that you cast on at the bottom cuff, and knit straight up to the neck. You pick up the drop sleeves and knit down, so the only seam in the whole thing was the crotch. I used 2 hanks of undyed sock yarn from Rebecca’s dye stash. Lovely stuff it is to knit with…..soft and forgiving, with good stitch definition. As I cast on for the cuff of the pants, it hit me that a little foot would go into this cuff eventually….how lovely. Then one leg…..another…..when you knit in the round like that it looks alive….like that Dr. Seuss story about the Pale Green Pants with Nobody Inside them! The romper was also fun because of the 6 different stitch patterns used throughout. On size 2.5 needles, the project was slow, so it was nice having the variety of stitches. 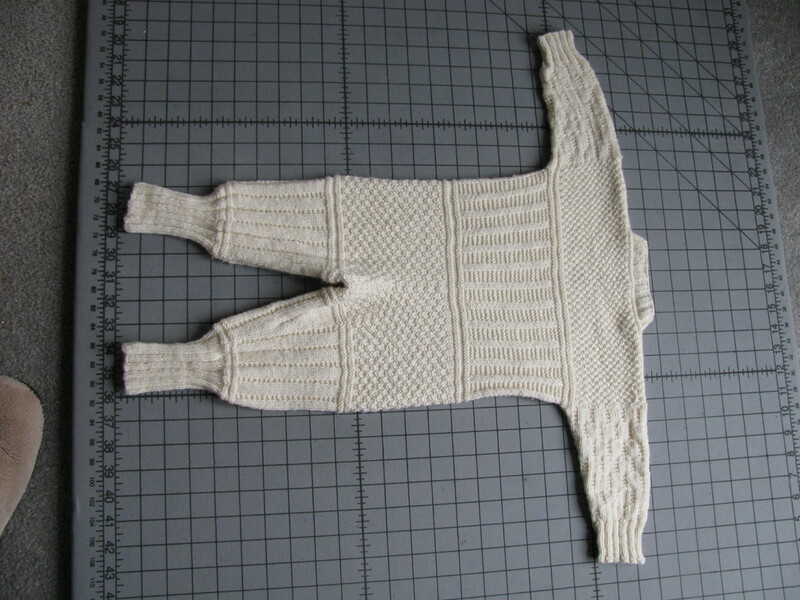 I finally finished the romper when Rebecca was 38 weeks. Great, I thought. We made it. 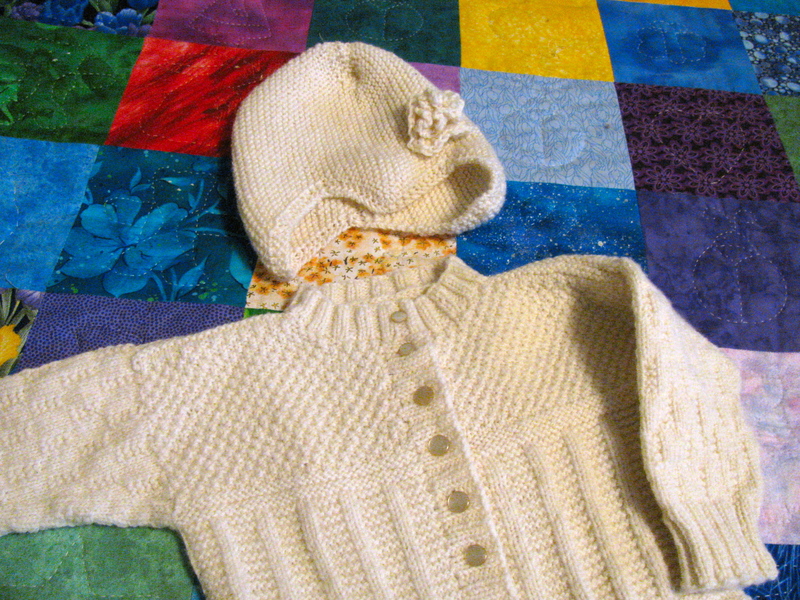 Hmm…..I have some yarn left and baby hasn’t come yet, how about a hat? So I cast on for the hat that goes with this pattern, and kept knitting…..waiting. Will baby come early after the vigor of being flipped from breech to head-down? Will that hat get done? The baby still had not come and there was more yarn, so I cast on for the booties. I packed suitcases for my husband and Bethany and myself. I finalized lists, discussed more alternate plans, and waited……one bootie done….cast on for 2nd bootie….keep going…..it WILL happen eventually! Every time the phone rang, I wondered would THIS be the phone call that would send us to Pittsburgh and allow us to meet the new little family member? By the middle of week 41 I was a basket case. My husband, my mom, and my friends hoped the baby would come for MY sake! Finally, 8 days after the due date, Jared called at 5:30 am. Woo hoo! I gathered the rest of my stuff including the 2nd unfinished bootie and 4 knitting projects! (Must NOT run out of knitting.) Bethany and I were on the road by 7:45…..no! 7:50 because I forgot a load of laundry and had to run back to the house. Of course I slipped on the icy driveway, so it was in muddy pants that I threw the clothes in with the computer and sat behind the wheel again. Oh well, at least we were on our way. The rest of the clan would come up later. As I headed west I was thinking we had a 50/50 chance of making it there by the actual birth. We arrived at the Old Economy Inn at 2:30. As you know, Rebecca was still in early labor and there was a long wait ahead. I knew she was going through some tough stuff…..esp. when I dropped by some requested fresh pineapple and she did not want a hug from Mom. Bethany and I prayed that night like we had hundreds of other times, and we fell asleep at 8:30. Thankfully I heard the 10:30 text that Jared sent indicating that they were in the final stages of labor. So I re-dressed and managed the 45 mins. circuitous route to the single door in downtown Pittsburgh where the midwife center was. I had packed some easy knitting and Bethany’s DS, but of course we were so tired! It was mainly the company of the Osborns and the miracle happening nearby that kept us awake until 2:15 when we finally got to hold Naomi. It was worth all the waiting. 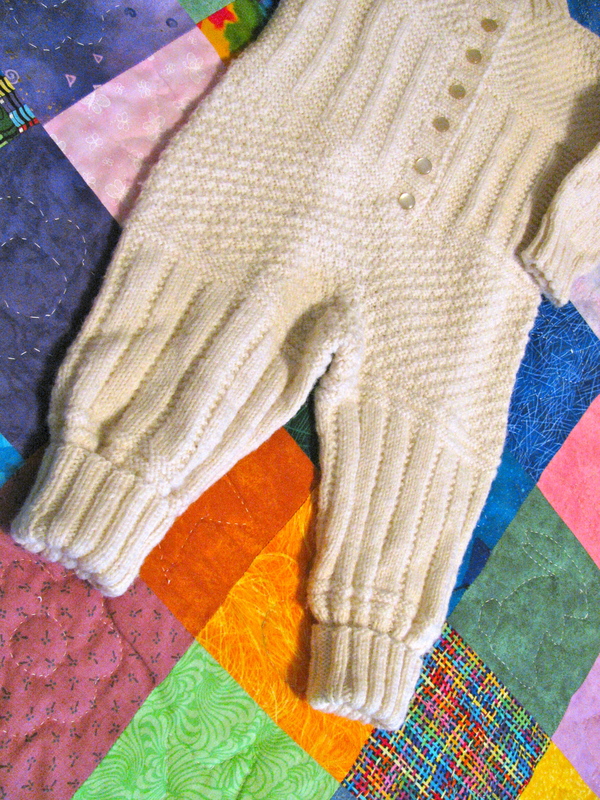 Knitting as a grandmother is fascinating. My husband remarked as he watched me that this was something grandmothers had done for thousands of years. Really, I thought? All I knew was that I HAD to do it. It helped me wait. It helped me not worry. It helped make her real. And 4 days later when I got to put her IN the romper….well that was a magical moment. Next, though, I’m going to knit her something colorful…..check out [the Berroco booklet] Socketera #280! I like the “Sage” in 4 colors of sock yarn. Yes!!! Love the jacket! You are so creative.